You are currently browsing the tag archive for the ‘nursery rhymes’ tag. Mother Goose on the Loose’ stands in a long tradition of nursery rhyme cartoons, from the Felix the cat cartoon ‘Felix in Fairyland’ (1923) via the Silly Symphony ‘Mother Goose Melodies‘ (1931) and ‘Mother Goose Land‘ starring Betty Boop (1933), to Disney’s ‘Mother Goose Goes to Hollywood’ (1938) featuring caricatures of Hollywood stars. Unfortunately, ‘Mother Goose on the Loose’ is weaker than any of these, hampered by a slow timing, corny gags and an obnoxious voice over. Even a jazzy tune, setting in after five boring minutes, cannot rescue the cartoon. Its only attraction is its obsession with dames, which are literally all over the cartoon. This makes ‘Mother Goose on the Loose’ a typical cartoon of the World War II era. Old King Cole throws an annual party at his castle, which ends at midnight. One can regard ‘Old King Cole’ as a remake of ‘Mother Goose Melodies‘ from 1931. Both cartoons feature nursery rhyme characters singing and dancing. 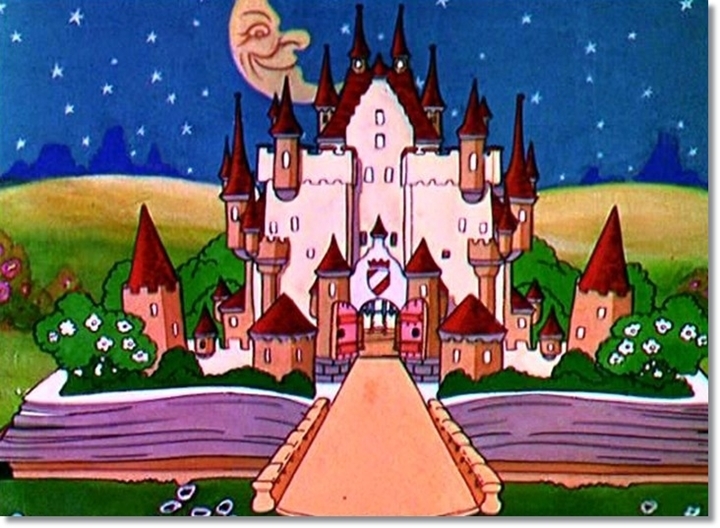 Although King Cole himself still has the same design he had in the earlier cartoon, the complete short shows an enormous progress in animation, which is elaborate and fluent throughout. In ‘Old King Cole’ the long song-and-dance routine is executed much more complexly than in the earlier short. Indeed, at times it is even reminiscent of the musicals of the era. It belongs to the operetta-Silly Symphonies of the mid-1930s, with all characters singing their lines. It features several original arrangements of classic nursery rhymes, with the sequence of the nine little Indians leading to a stunning finale, with all characters dancing to an Ellingtonian jungle rhythm. But then Hickory, Dickory and Dock spoil the fun, telling the audience it’s midnight, and all nursery rhyme characters flee back to their books. King Cole himself has the last shot, singing goodnight to the audience. ‘Old King Cole’ contains no story whatsoever, but the film’s sheer joy, its complex designs and its bright colors make this cartoon yet another highlight within the Silly Symphony series.